The MacArthur Leyte Landing Memorial National Park (also known as the Leyte Landing Memorial Park and MacArthur Park) is a protected area of the Philippines that commemorates the historic landing of General Douglas MacArthur in Leyte Gulf at the start of the campaign to recapture and liberate the Philippines from Japanese occupation on 20 October 1944. This event led to the largest naval battle of World War II (Also the world's largest naval battle in terms of gross tonnage sunk) and Japan's eventual defeat and surrender after almost three years. The war memorial is located in the municipality of Palo on Leyte island in Eastern Visayas and is one of the region's major tourist attractions. It was declared a national park on 12 July 1977 through Letter of Instructions No. 572 signed by President Ferdinand Marcos. The MacArthur Landing site sits on a 6.78 hectares (16.8 acres) coastal plain in the barangay of Candahug, some 5 kilometres (3.1 mi) south of Leyte's provincial capital Tacloban. It was formerly named Imelda Park after former First Lady Imelda Marcos who hails from Leyte Province. The park's focal point are the seven double-life-sized bronze statues on a shallow manmade pool depicting MacArthur and his entourage during the historic A-Day Landing as captured in the iconic photo by Gaetano Faillace. They were President-in-exile Sergio Osmeña, Lieutenant General Richard Sutherland, Brigadier General Carlos P. Romulo, Major General Courtney Whitney, Sergeant Francisco Salveron and CBS Radio correspondent William J. Dunn. [a] Designed by sculptor Anastacio Caedo and inaugurated during the 37th anniversary of A-Day in 1981, the statues mark the spot where MacArthur fulfilled his promise of "I shall return" at Red Beach, so-called for the blood spilled on it during the war. In front of the statues, two historical markers in English and Filipino can be found explaining the significance of the scene being depicted. A museum stands adjacent to the site which contains historic photographs and other memorabilia of General MacArthur including a copy of his speech upon landing and a bronze cast of his footprints. Palo's regional government center is located right across from the memorial. Other notable structures nearby include the Rock Garden of Peace inaugurated during its 50th anniversary in 1994 when the memorial was also declared a national historic landmark by the National Historical Commission; and the Leyte Oriental Hotel, formerly MacArthur Park Beach Resort, which was originally built by Imelda Marcos in 1983. The park is accessible via the Pan-Philippine Highway (AH26) from Tacloban and the Daniel Z. Romualdez Airport. The official story of October 20, 1944 was of MacArthur waiting and watching aboard the USS Nashville. The general was said to have waded in knee-deep waters as his craft grounded to a halt due to the shallow sea, sporadic fire from the enemy notwithstanding. There had been rumors that the landing photo had been staged as it was reported by the New York Times that Osmeña had landed on Leyte on October 21, one day after the reported MacArthur landing date. There were also the three photographs taken at varying angles of their landing, furthering the impression that everything had been rehearsed. The park is the site of the annual memorial rites and reenactment of the historic Leyte landing attended by local and foreign dignitaries together with war veterans and their families. On November 08, 2013, the memorial was damaged by Typhoon Haiyan (Yolanda) (The world's strongest recorded Supertyphoon) with one of its seven statues, the Carlos Romulo statue, knocked from its base. It was immediately repaired by the government and the statue of Carlos P. Romulo was restored within twenty days with assistance from the Metropolitan Manila Development Authority. ^ The person identified as Francis Saveron in William Dunn's book Pacific Microphone is called in other sources like The New York Times and Filipinos in Washington, D.C. as Francisco Salveron. ^ "Letter of Instructions No. 572". Chan Robles Virtual Law Library. Retrieved 27 September 2014. ^ a b "Region 8 - Protected Areas". Biodiversity Management Bureau. Retrieved 27 September 2014. ^ a b McCallus, Joseph P. "The MacArthur Highway and Other Relics of American Empire in the Philippines". Potomac Books: Washington, D.C. Retrieved 27 September 2014. ^ Dunn, William J. "Pacific Microphone". Texas A&M University Press. Retrieved 27 September 2014. ^ Goldstein, Richard (1 September 1998). "Francisco Salveron, MacArthur's Aide, Dies at 88". The New York Times. Retrieved 12 November 2014. ^ Cacas, Rita M.; Lott, Juanita Tamayo. "Images of America: Filipinos in Washington, D.C." Arcadia Publishing. Retrieved 12 November 2014. ^ "Francisco Salveron: Aide to MacArthur". Milwaukee Journal Sentinel. 2 September 2014. Retrieved 12 November 2014. ^ "Ceremony on Tuesday to Recall MacArthur's Philippine Landing". Reading Eagle. Retrieved 27 September 2014. ^ "The Sunniest Day in October". Manila Bulletin. Retrieved 27 September 2014. ^ a b "MacArthur memorial also damaged by 'Yolanda'". Manila Bulletin. Retrieved 27 September 2014. ^ "Remembering the Leyte Gulf Landing". Philippine Information Agency. Retrieved 27 September 2014. ^ "Leyte takes over Imelda-built resort". Philippine Daily Inquirer. Archived from the original on 18 December 2014. Retrieved 27 September 2014. 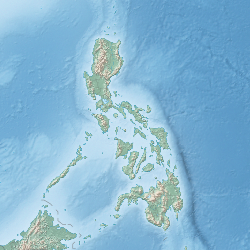 ^ "Leyte SP happy with Leyte Oriental's reconstruction". Philippine Information Agency. Retrieved 27 September 2014. ^ "LEYTE | The Story Behind the MacArthur Landing Memorial National Park at Palo". Lakad Pilipinas. Retrieved September 12, 2018. ^ "After 20 days, Romulo statue upright again, wading ashore with MacArthur". Interaksyon. Retrieved 27 September 2014. Wikimedia Commons has media related to Leyte Landing Memorial.